I am a classic rock kind of guy at heart, probably because I am old. But I just cannot get into any of the electronic stuff that passes for music these days, and every pop singer and song written today sounds the same to me. I want to dig deeper and find talent that is not being forced down our throats, so I decided to start reviewing local albums. This first review is from a brand new band out of Buffalo that is going to be really hard to ignore as time goes by. Spacelord has the image, sound, and look it needs to start making waves all over the world, but it all starts right here in Western New York. 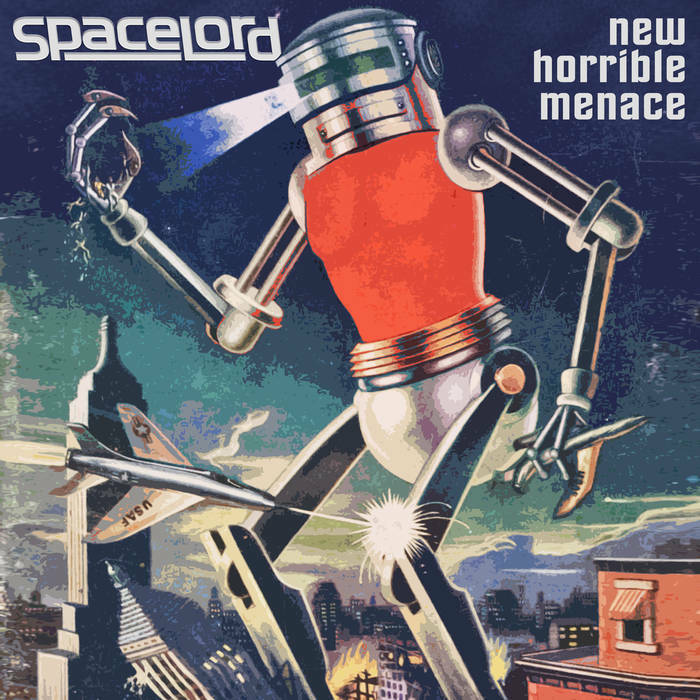 Spacelord's first release is a three-song EP entitled New Horrible Menace. I'm going to get right to the point here, because that is what this music is all about. This is a cross between Black Sabbath and Led Zeppelin, with a little Pink Floyd thrown in there for ambiance. If you love that old classic rock sound set to new ideas and new lyrics, then this is exactly what you are looking for. The guitars are heavy, the drums and bass together are punishing, and the vocals soar. In other words, this is really good stuff. The band's website is located at http://www.spacelordband.com. You can listen to all three tracks from New Horrible Menace, and I highly recommend that you do, at https://spacelordband.bandcamp.com/album/new-horrible-menace. The production on this EP is clean, and the songs are strong. There is a strong groove in each song, but in songs like "The Hammer Falls" the groove is different from what you are used to. This music will appeal to a wide range of music fans, and I hope this is an EP that gets younger people listening to guitar-based music again. Some stand out moments on the EP include Grabianowski's vocals on "Iron and Pride" (including the catchy and inventive melodies he sings), the drum work throughout the entire album, the tasteful way in which the lead guitar weaves throughout each song, and the well-controlled bottom end of Cappiello's bass (especially on "Harbinger"). I could talk all day about this EP, but I strongly recommend that you listen to it for yourselves. Another aspect of Spacelord I like is that they get a lot across in a four-minute format. The songs feel epic, but they do not get so self-indulgent that you want to turn them off. This is good rock music for people who enjoy a lot of energy. George N Root III has been playing live music for decades and continues to enjoy a life played out on the live stage. Follow him on Twitter @georgenroot3, or send him a message at georgenroot3@gmail.com. WNY bands looking to have their recordings reviewed can submit MP3 files to georgenroot3@gmail.com.